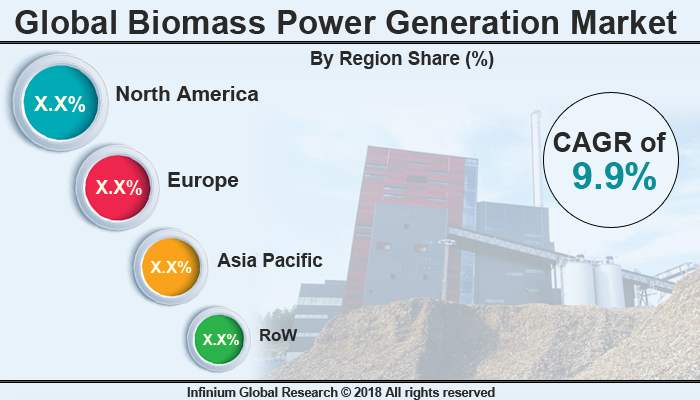 A recent report published by Infinium Global Research on biomass power generation market provides in-depth analysis of segments and sub-segments in global as well as regional biomass power generation market. The study also highlights the impact of drivers, restraints and macro indicators on the global and regional biomass power generation market over the short term as well as long term. The report is a comprehensive presentation of trends, forecast and dollar values of global biomass power generation market. According to the report the global biomass power generation market is projected to grow at a CAGR of 9.89% over the forecast period of 2018-2024. Biomass is an organic material that comes from plants and animals. It contains stored energy from the sun when it is burned, the chemical energy present in it is converted into heat energy. The electricity that is produced by utilizing surplus biomass sources into energy is considered biomass power. Biomass combustion in a boiler results in the production of steam. This steam drives a turbine generator thus resulting in the production of electricity. This electricity is fed into the high voltage transmission grid which is then transported to the end-users. Biomass is one of the most plentiful and well-utilized sources of renewable energy in the world. Generation of power through the use of biomass represents the cost-effective and cleanest way to provide renewable electricity in biomass potential regions with high levels of biomass resources and its processing activity. Furthermore, the use of this resource helps a nation become more energy independent. The global biomass power generation market is primarily driven by the need to control the emission of GHG and also due to the abundant availability of energy-rich biomass. However, the major challenge which restrains the growth of the biomass power generation market is the problems associated with the management of biomass collection, storage, transportation, and processing. Nevertheless, the demand for the cost-effective and sustainable supply of energy creates an opportunity for the growth of the biomass power generation market. Geographically, countries of North America region holds the largest market share in biomass power generation market owing to the increase in demand for an environment-friendly renewable source of energy. Asia- Pacific is also one of the fastest growing regions owing to the advancements in power generation technologies using biomass in this region. In addition, countries like Finland, Brazil are significantly growing due to the extinction of fossil fuels and the need for sustainable energy. The report on global biomass power generation market covers segments such as process and feedstock. On the basis of process, the global biomass power generation market is categorized into combustion, gasification, anaerobic digestion and pyrolysis. On the basis of feedstock the global biomass power generation market is categorized into agricultural & forestry residues, urban wastes, animal manure, and energy crops. The countries covered in the North America region include the U.S., Canada, and Mexico; while Asia-Pacific includes China, Japan, India, South Korea, Malaysia, and among others. Moreover, Germany, U.K., France, Spain, and Rest of Europe are included in the European region. The U.S. drives the growth in the North America region as it is the largest market in the region. The Asia-pacific region offers substantial potential for the market growth owing to rapid growth in markets such as India and China. The APAC region is projected to experience growth at a CAGR of x.x% over the period of 2018-2024. The report provides profiles of the companies in the global biomass power generation market such as Helius Energy Plc, Ameresco, Inc., EON, The Babcock & Wilcox Company, Engie, Drax Group plc, Forth Energy Ltd., Alfagy Ltd., Bilfinger, and Indus Green Bio Energy Pvt. Ltd. The report provides deep insights on demand forecasts, market trends, and micro and macro indicators. In addition, this report provides insights into the factors that are driving and restraining the global biomass power generation market. Moreover, IGR-Growth Matrix analysis given in the report brings insight into the investment areas that existing or new market players can consider. The report provides insights into the market using analytical tools such as Porter's five forces analysis and DRO analysis of biomass power generation market. Moreover, the study highlights current market trends and provides forecast from 2018-2024. We also have highlighted future trends in the biomass power generation market that will impact the demand during the forecast period. Moreover, the competitive analysis given in each regional market brings insight into the market share of the leading players. This report will help manufacturers, suppliers, and distributors of the biomass power generation market to understand the present and future trends in this market and formulate their strategies accordingly.